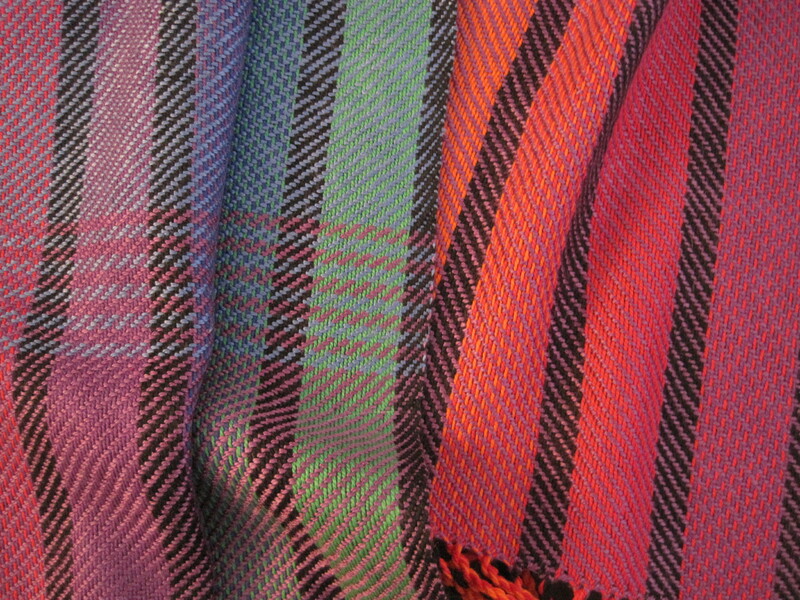 What a joy it was to weave these two scarves in Supplementary Warp technique. The idea for these came from seeing a similar piece on Pinterest, with a link back to the blog of “gangewifre-dot-blogspot-dot-com”, who, in turn, was inspired by the weaving of artist Juanita Giardin. Circles within circles as ideas are passed on from one weaver to the next, and to the next in a craft that has endured for thousands of years. 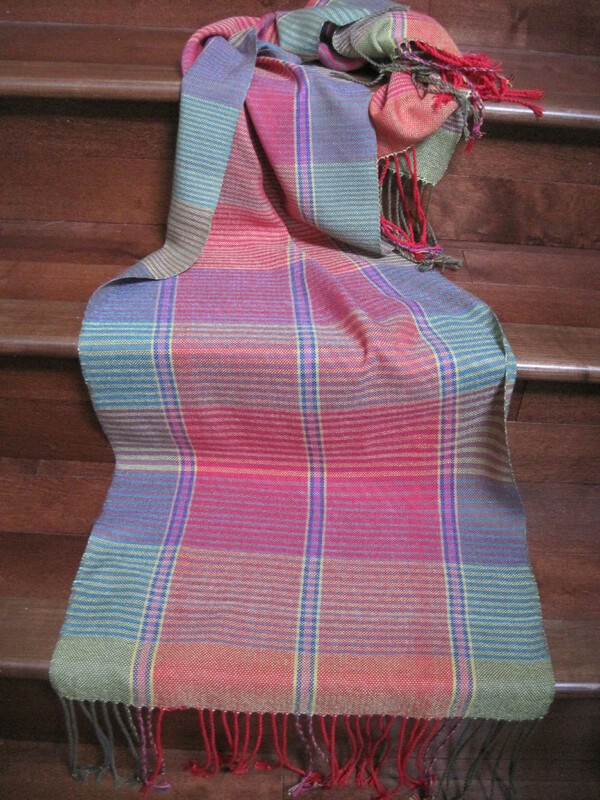 Examples of supplementary warp fabrics can be found across many times, places and cultures, from as early as 5th century Southeast Asia, pre-Hispanic Peru and Ecuador, 18th century Europe and Scandinavia to modern times. 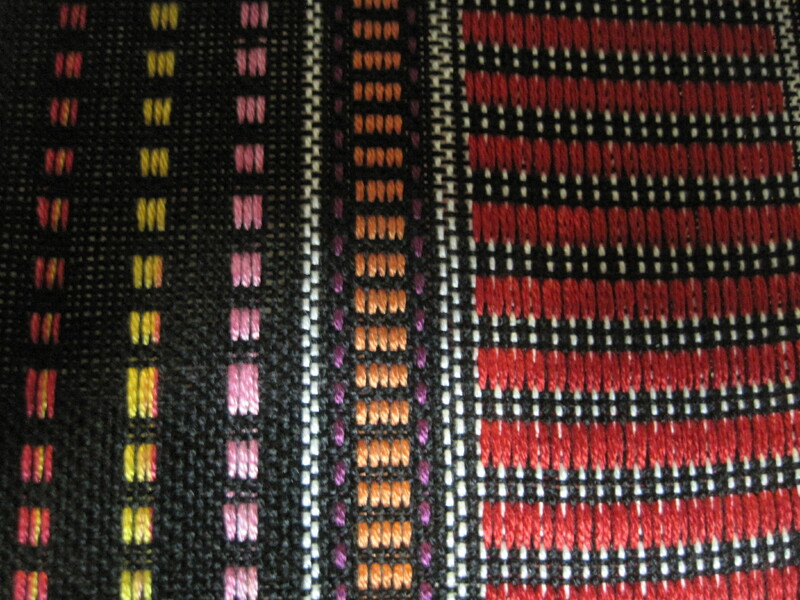 Contemporary weavers have an abundance of yarns and colours to choose from, keeping everything fresh and exciting. 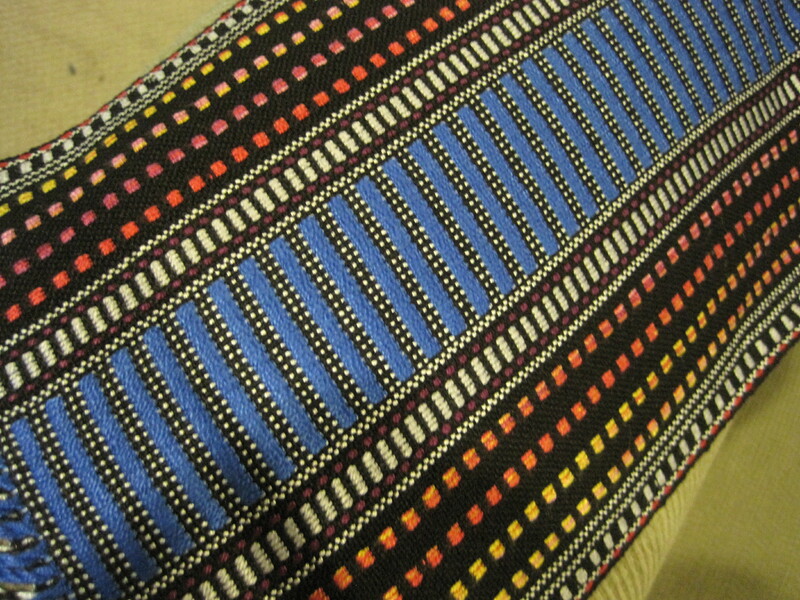 Mine are woven in richly-coloured Tencel, with the supplementary colours on top of a black and white ground. 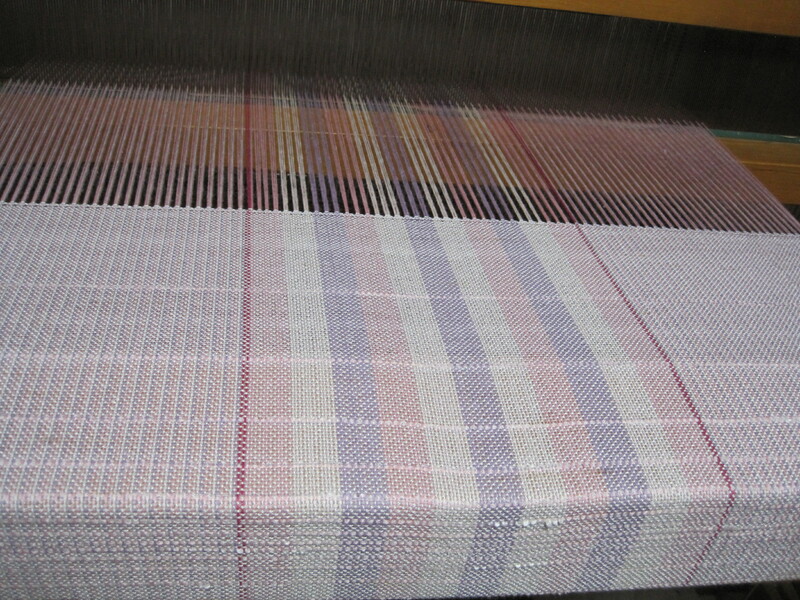 In supplementary warp technique, the extra pattern-making threads float over and under a ground warp, usually plain weave. What a wonderful way to add a decorative element to an otherwise unadorned piece. 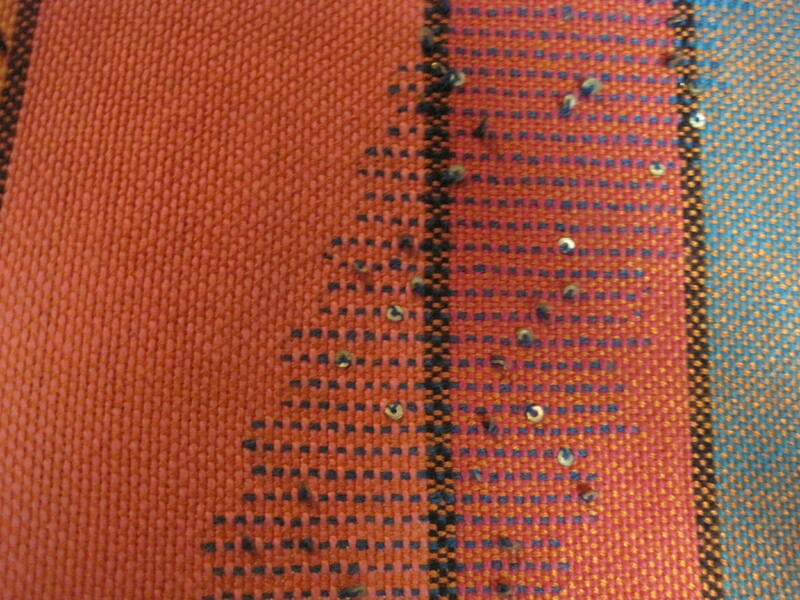 The plain weave ground is threaded on shafts 1 and 2, and the extra pattern warps are independently threaded on the remaining shafts. The extra shafts are lifted for a while, allowing the pattern threads to float over the ground, then, as the shafts are lowered, they interlace through the cloth and continue to float underneath. The over and under, over and under rhythm continues, making beautiful dots and dashes of colour. Different patterns can be made, depending on how many independent shafts are available. For an eight-shaft loom, like I have, there are six independent shafts. 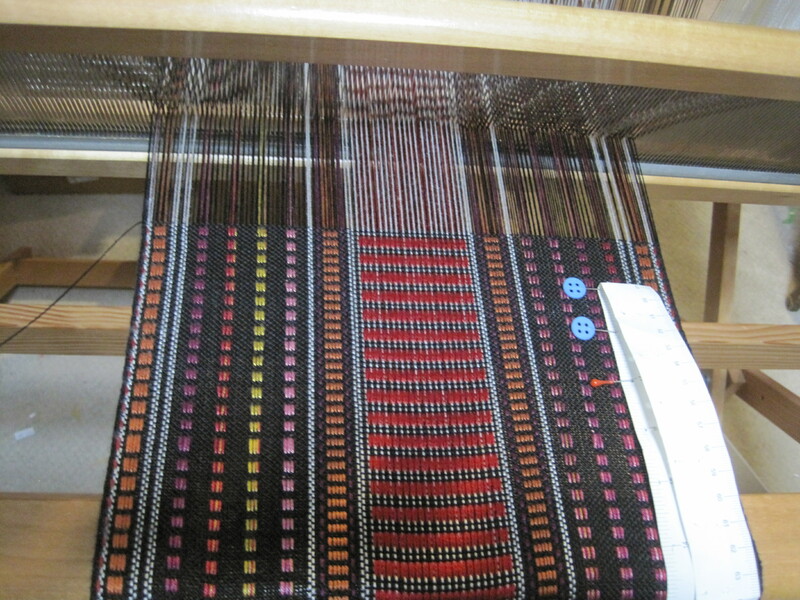 The scarves I wove have a 24-pick repeat, and so are more easily accomplished on a table loom. The hard, slow work is in designing and setting up the loom. After that, the weaving itself progresses quite quickly. 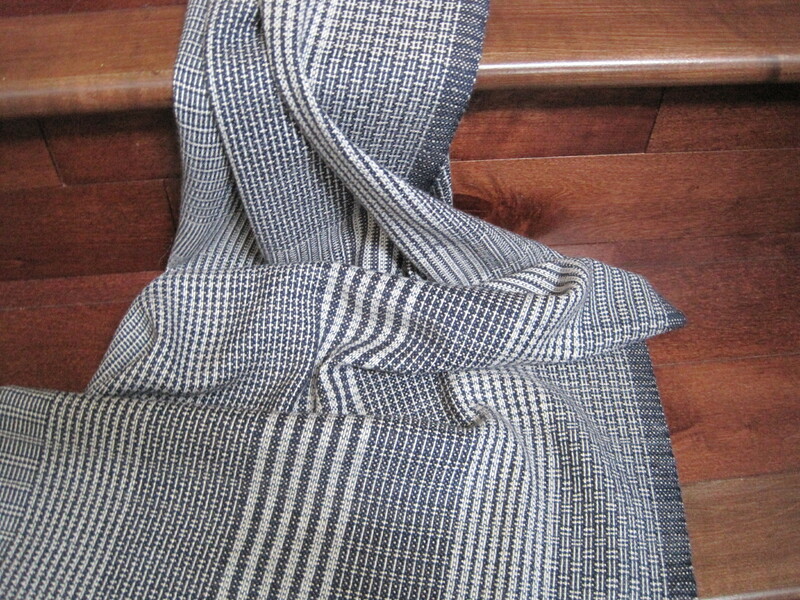 Woven in 2/8 Tencel, the scarves are soft and silky. I wove the red scarf first, and then I pulled out the red and gold threads, replacing them with blue and silver for the second scarf. I am so motivated to continue exploring this technique. I taught a workshop on Ikat weaving and wrapped, dyed and wove an exploration piece for myself and for demonstration purposes. This piece is the result. 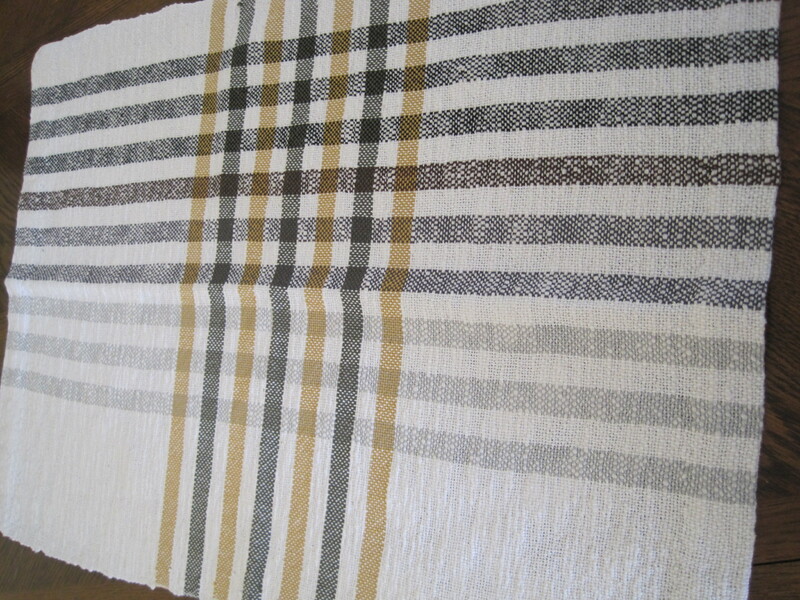 The warp and weft are mostly 2/20 mercerized cotton, sett at 24 ends per inch and woven at 24 picks per inch. I made the warp 4 yards long which gave me lots of room to play around. 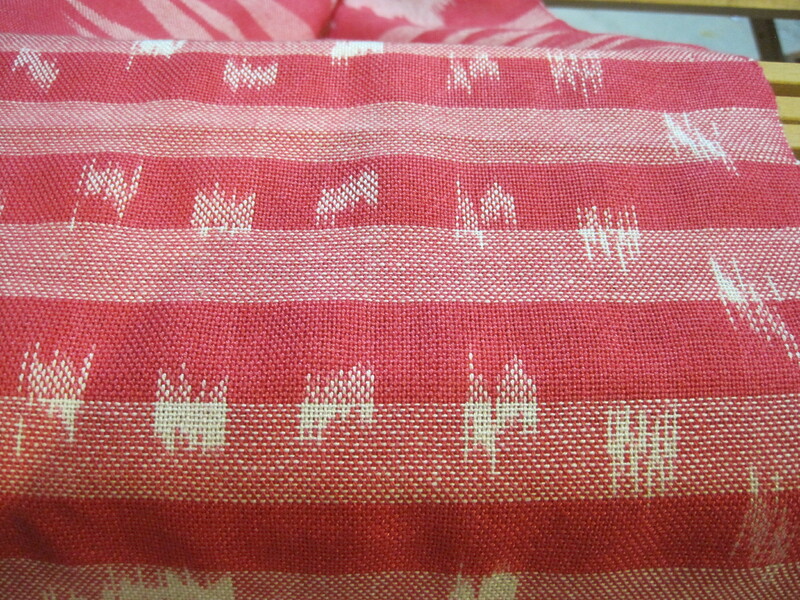 The warp and most of the weft was 2/20 mercerized cotton dyed in Procion MX in Carmine Red. 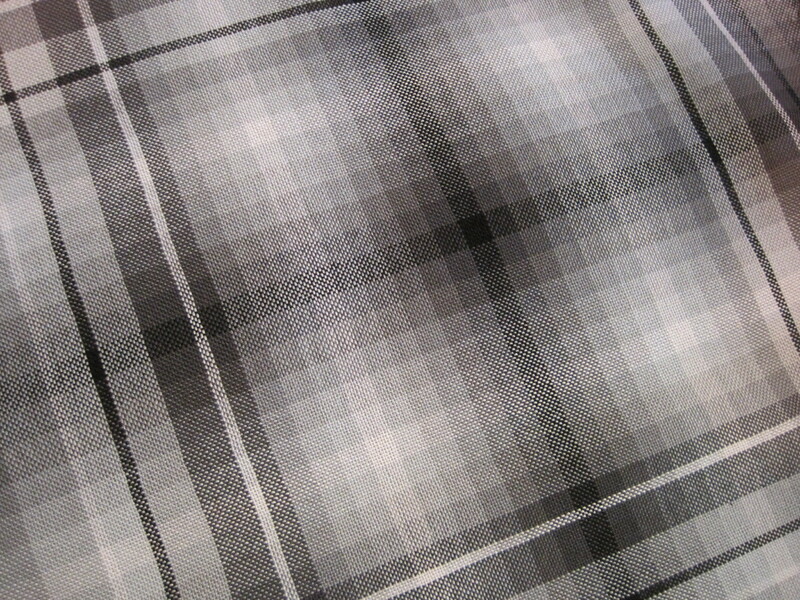 Woven in plain weave. Once I started weaving, I realized that I did not have enough of the 2/20 cotton to weave the whole weft, but I used every inch I had. I subbed in some natural 2/16 cotton along the way, and got some nice, coloured areas in the finished scarf. 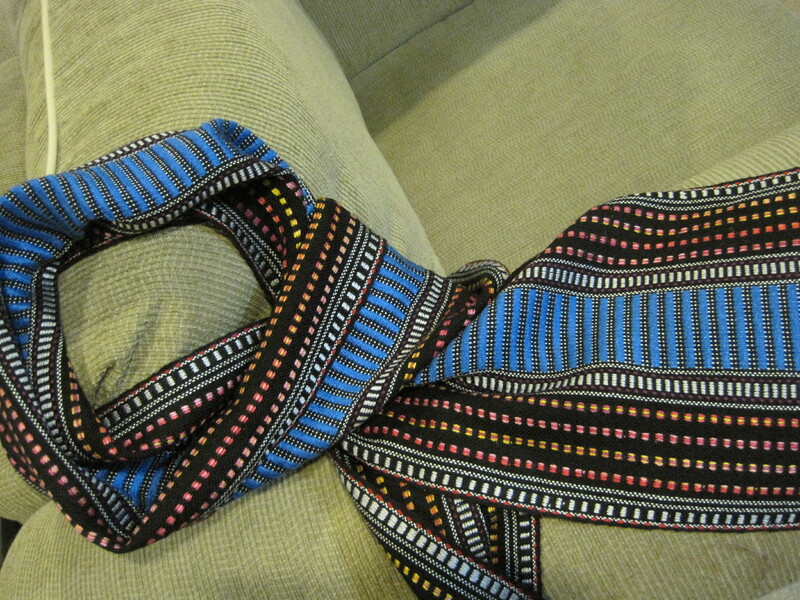 I wrapped the first section in a specific pattern, with sections running from 2 inches to 4 inches long. 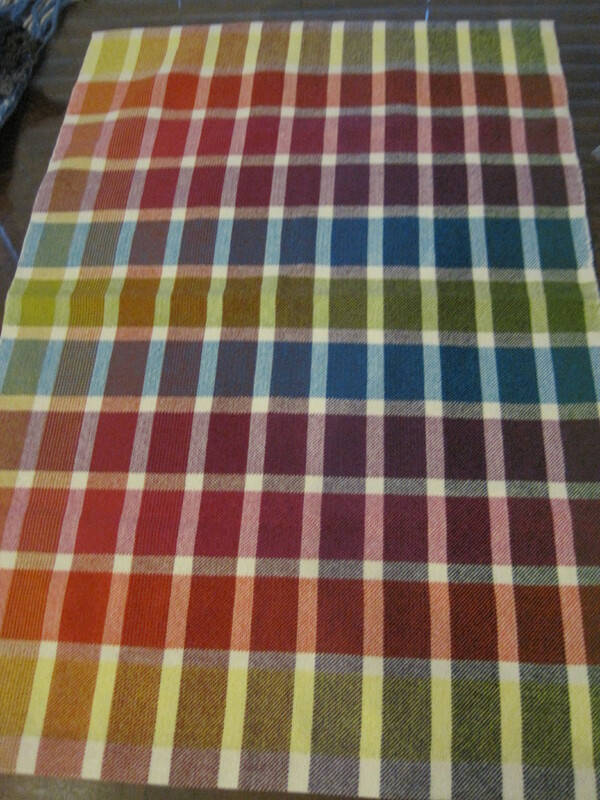 In putting it on the loom (front to back) some of the sections became misaligned. Next time I would take more care in lining up the sections more accurately. When woven, though, they came out looking crisp, and filled the space effectively, as planned. I wrapped the second half of the scarf in short half-inch sections in a random pattern. After weaving, they remind me of falling rain and I like how the wrapped areas have a different appearance when they are woven with natural, compared to the areas woven with red. 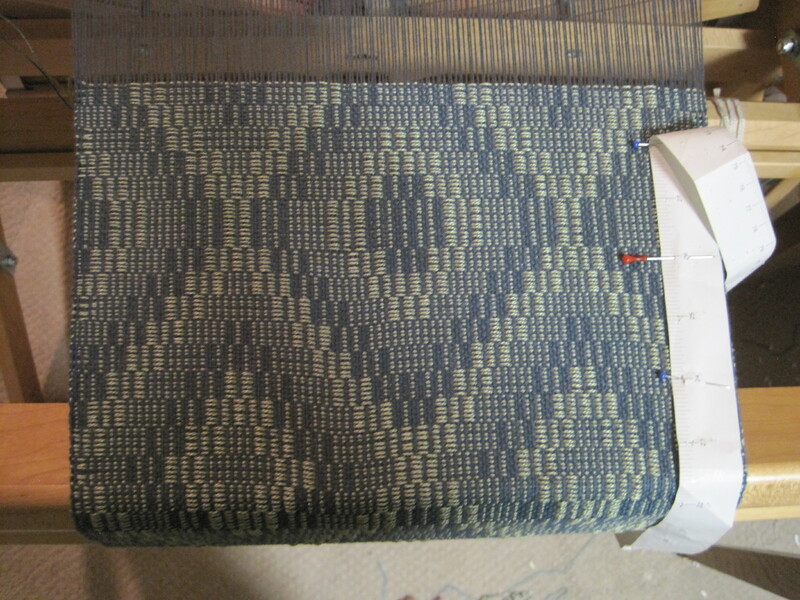 In the centre, between the two warp ikat areas, I placed a small amount of weft ikat in a pretty pattern. Because the weft shots were longer than the width of the scarf, I gathered the ends together in braids. Overall, a fun, conversational piece to wear. I started a new “spinning” class this week at Place des Arts, with seven wonderful new beginners. I look forward to getting to know each individual better over the next few weeks, as I introduce you to the gentle art of spinning yarn. I love watching the progress as tense, wobbly movements with many breaks and joins produce that first lumpy yarn. A week later, movements and thread begin to smooth out and breathing is calmer. Later still, laughter and joy as handfuls of fluff more easily turn into smooth, continuous threads as hand-eye-foot coordination kicks in and muscle memory takes over. Spinning, I believe, is an inherited instinct. As our spun threads strengthen, so too, do our connections to each other, and to our ancestors. 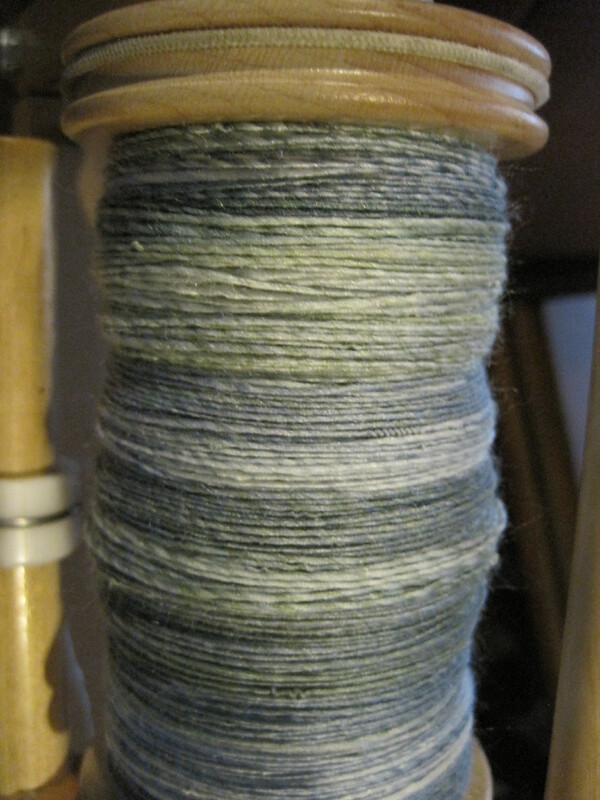 Welcome new friends to our spinning community. Hope you like the neighbourhood. As we slide into the new year my looms are full or on the way to becoming full. 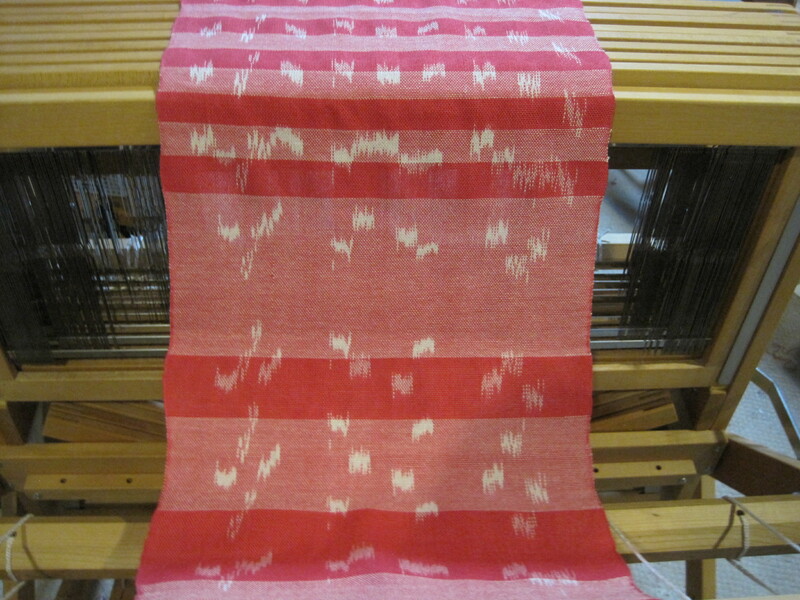 On the big loom, the Queen of my studio, I have a pale pink warp for some subtle Spring shawls. 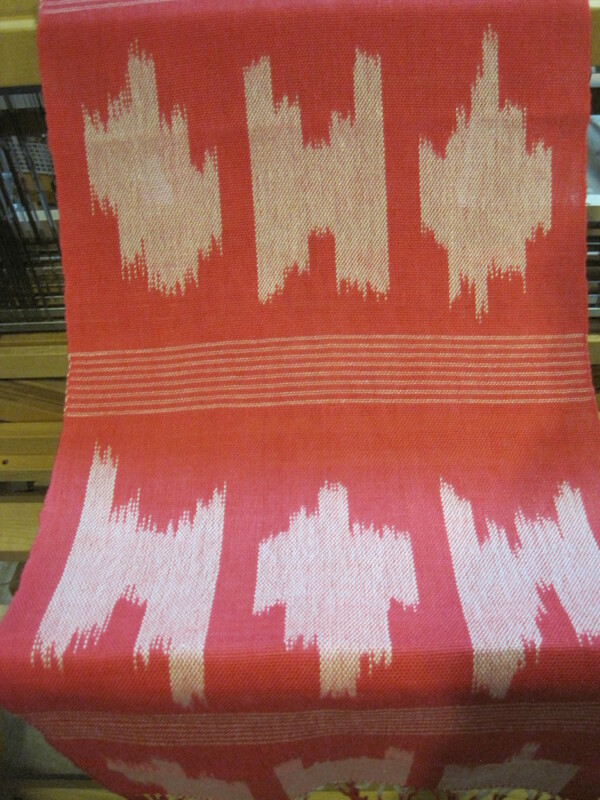 The warp is 2/8 cotton in three shades of pink, with a fuchsia zinger. The first shawl is being woven in plain weave with 2/20 silk in a pale grey called “Rainy Day”, with occasional shots of a multi strand textured rayon in pinks and greys. Twenty-four inches wide in the reed, and it will be woven to 84 inches long. In the finishing, I will attempt to add tassels in the same multi-strand accent thread. 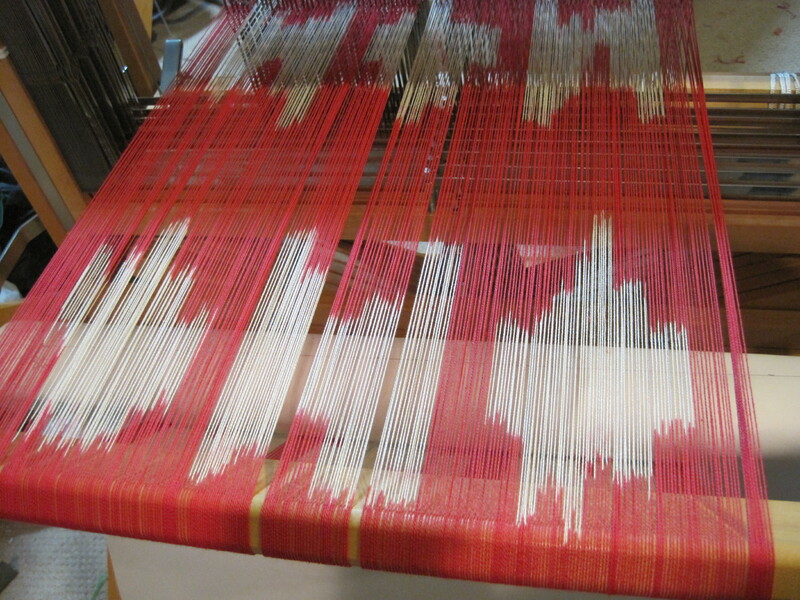 On Loomella, the 8 shaft Baby Wolf, I am in the process of sleying an Ikat warp hand-dyed in a beautiful shade of carmine red. 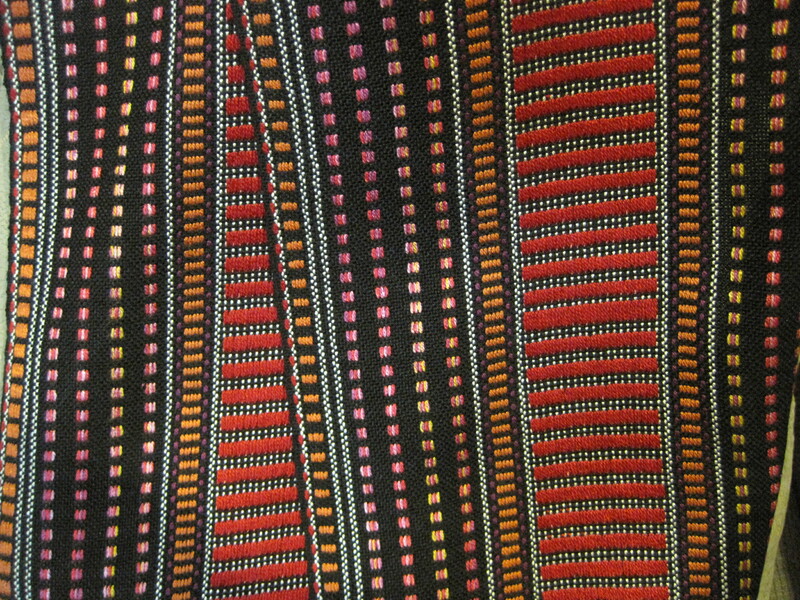 In December I taught a beginner’s course on Ikat weaving, and this was one of the samples I used to demonstrate the wrapping and tying method. This is a 2/20 mercerized cotton (Thanks Irene). 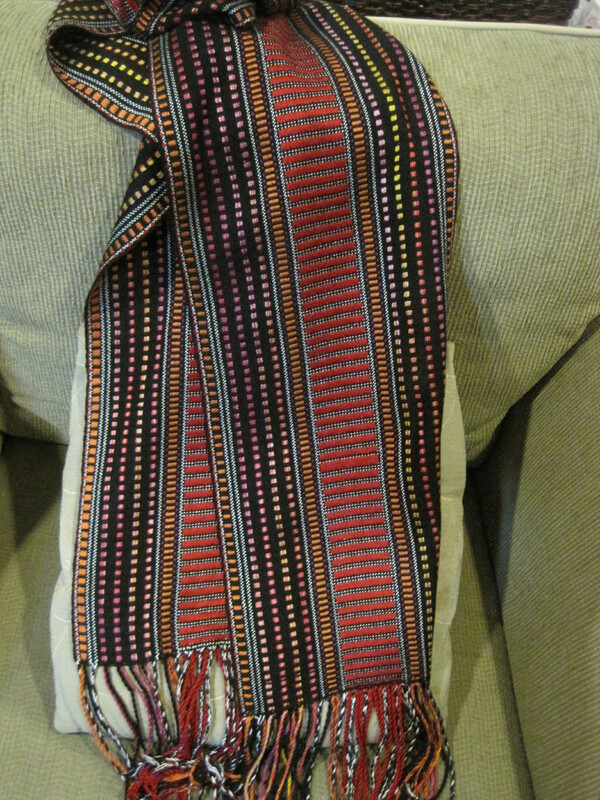 There are two distinct wrapped section, one more formal, and one more casual, so the two ends of the scarf will be unique. 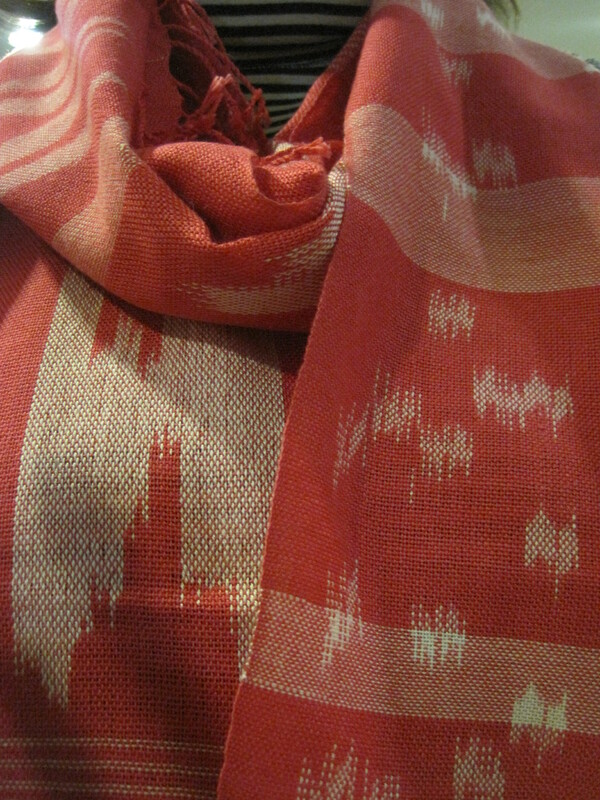 I know I didn’t dye enough matching red weft for a scarf, so I will weave it in a combination of red and white weft. 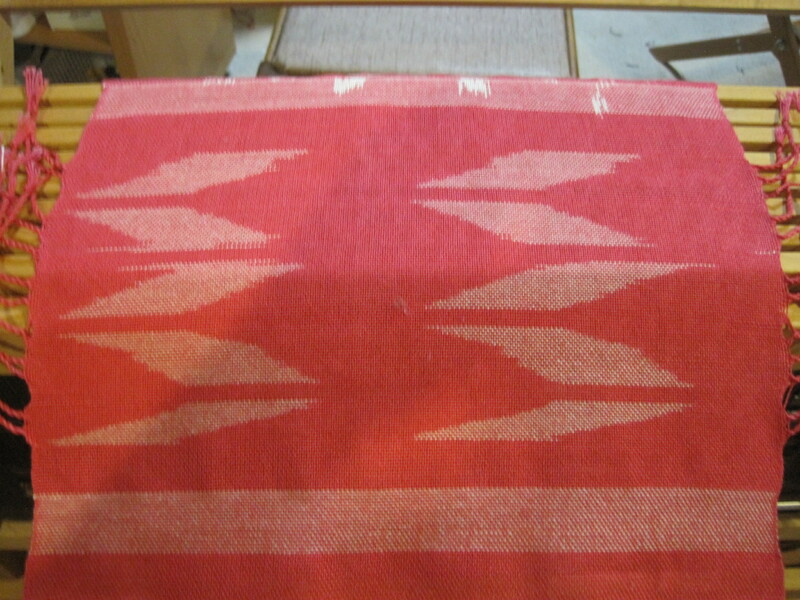 I did dye a little bit of Weft Ikat, which will also play its part in the finished scarf. Excited to see where this will lead. 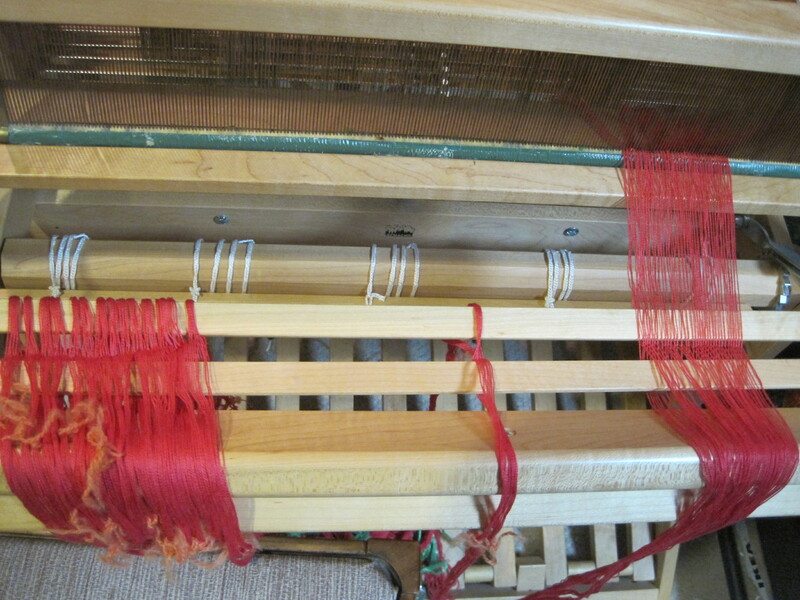 On Amy Ashford, my 32 inch, 8-shaft Ashford table loom, I am playing with Supplemental Weft. I found this draft on “gangewifre-dot-blogspot-dot-com”, under supplementary warps bit of research (posted July 8, 2016), which was inspired by the lovely scarves of Juanita Girardin. So, if you are interested in the draft, this is the blog to look at. My warp and weft is 2/8 tencel. 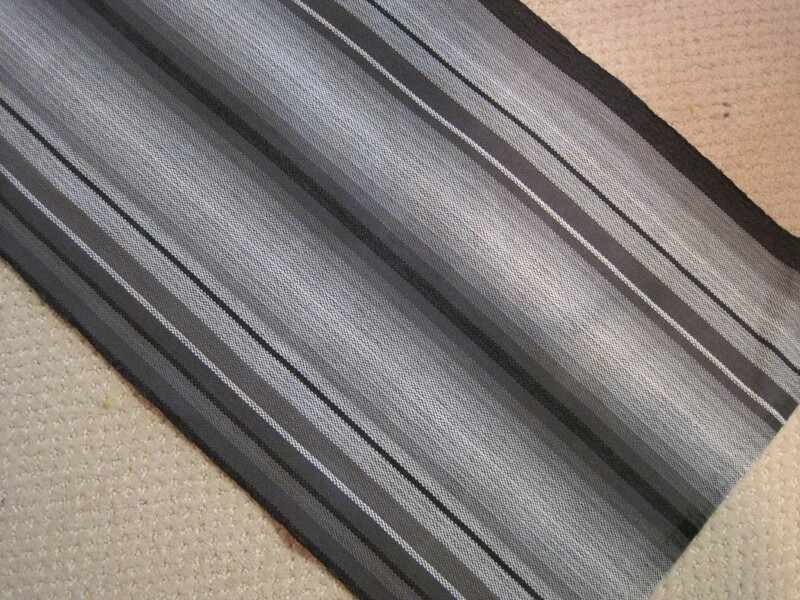 The tencel is doubled for the pattern warp, and the background cloth is black and white stripes. It is a lot of fun, and I would be happy to do more. This piece had to go on a table loom because it requires 24 treadles. A workout for my arms flipping toggles, but worth it. All the work is in warping and dressing the loom, after that the weaving is smooth sailing with one shuttle of black tencel. It is a delight watching the supplementary threads dive over and under the ground cloth. Two scarves at the same time on the JST muted colour warp gamp. I dropped the centre threads, so that the left scarf is predominately warm colours and the right scarf is predominately cool colours. 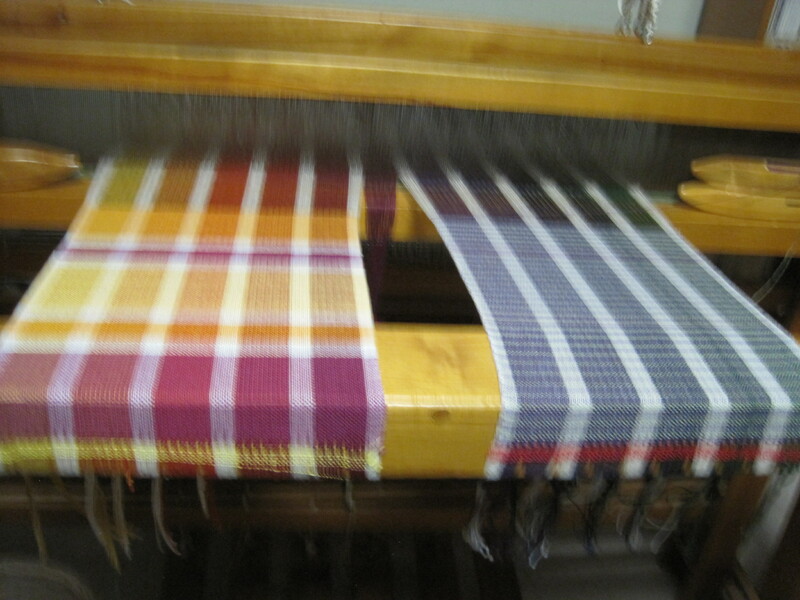 warp is 2/8 cotton, and the weft is silk, sett 16 ends per inch. 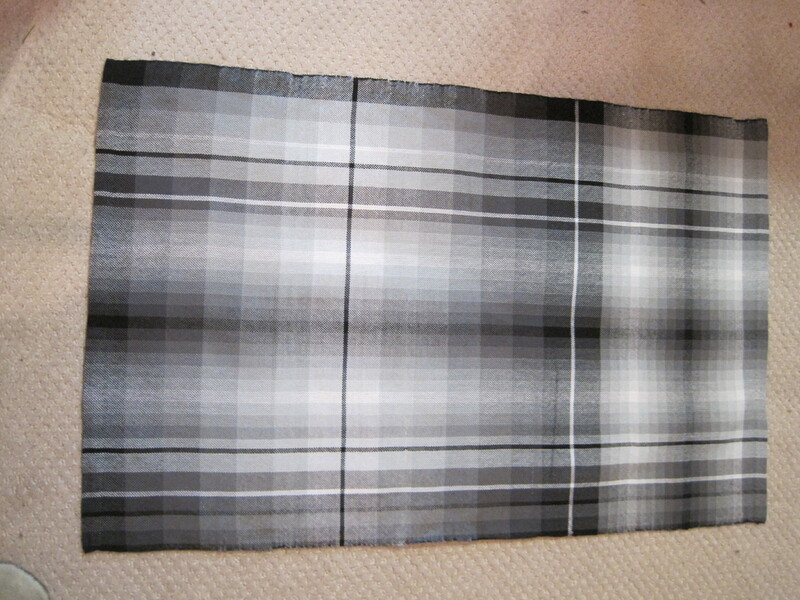 This is slower than just weaving one at a time, but is plain weave. It probably would have been easier if the pattern/colour order was similar, but it is just a matter of counting two things at the same time, and a lot of stopping to measure. 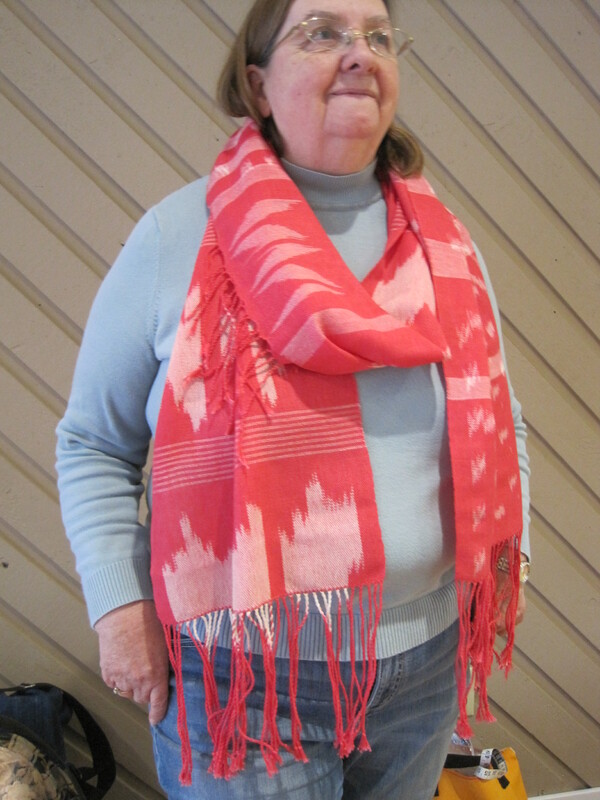 Each scarf is about 9.5 inches wide. 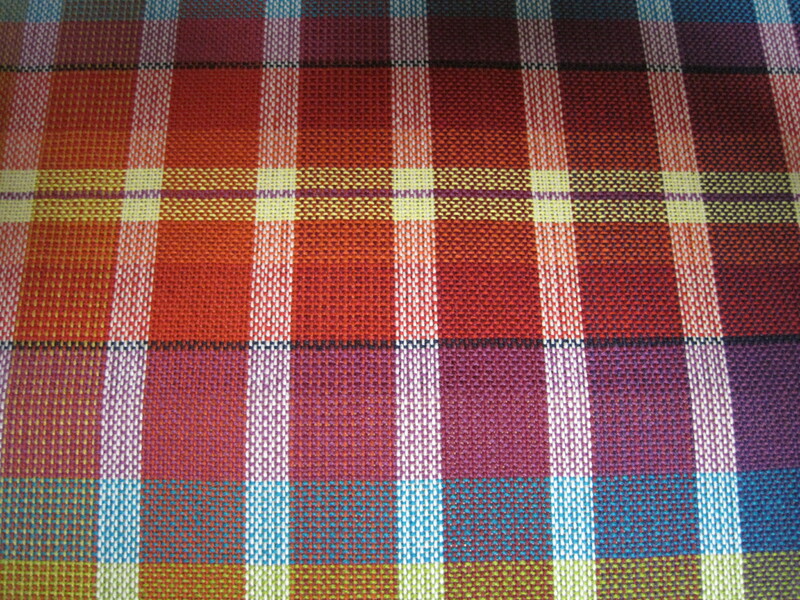 2.8 cotton warp, silk and cotton weft. 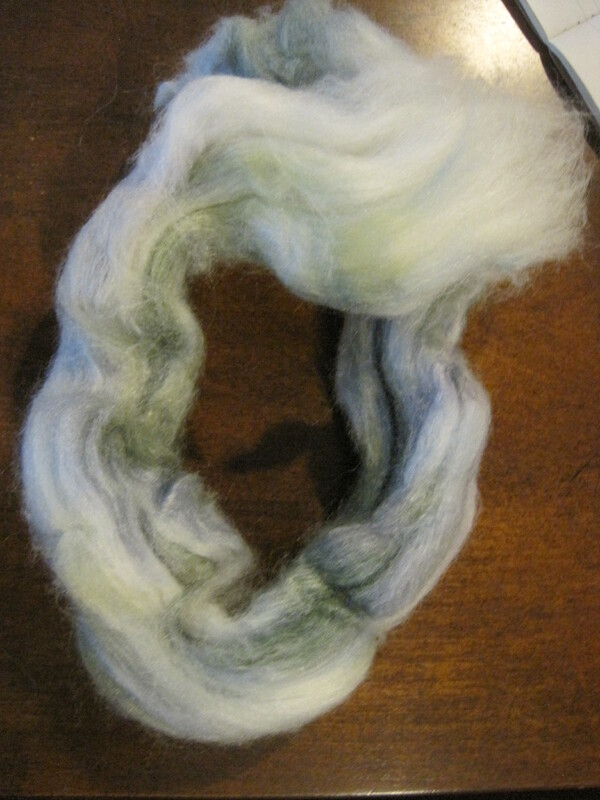 On my spinning wheel, a lovely merino/silk blend. Hand dyed by Smith and Ewe, the colour is called “Winter in Tofino” and showcases the white, grey, green of a moody winter day in this Vancouver Island west coast community. 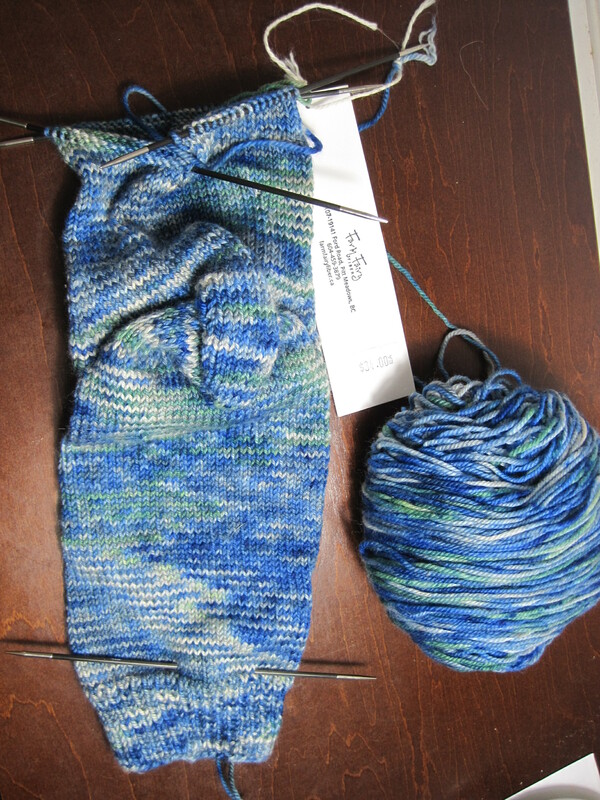 And knitting a simple pair of socks from yarn hand dyed by Farm Fairy Fibres. This is sock #2, almost finished. 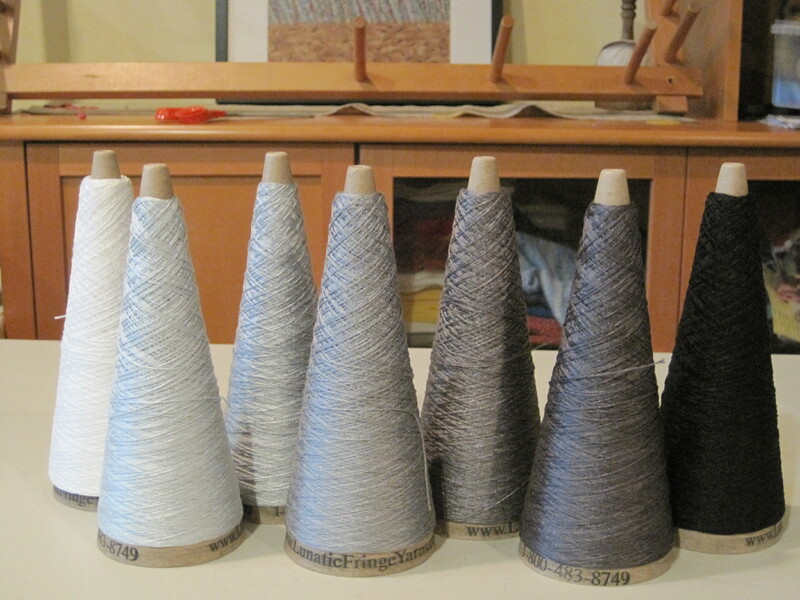 This weekend I attended the market place at the Textile Society of America Symposium where Greater Vancouver Weavers and Spinners had a booth, and then on Sunday went to the great charity yarn sale at Van Deusen Gardens and added to my stash of silk, rayon, and linen with some great bargains. 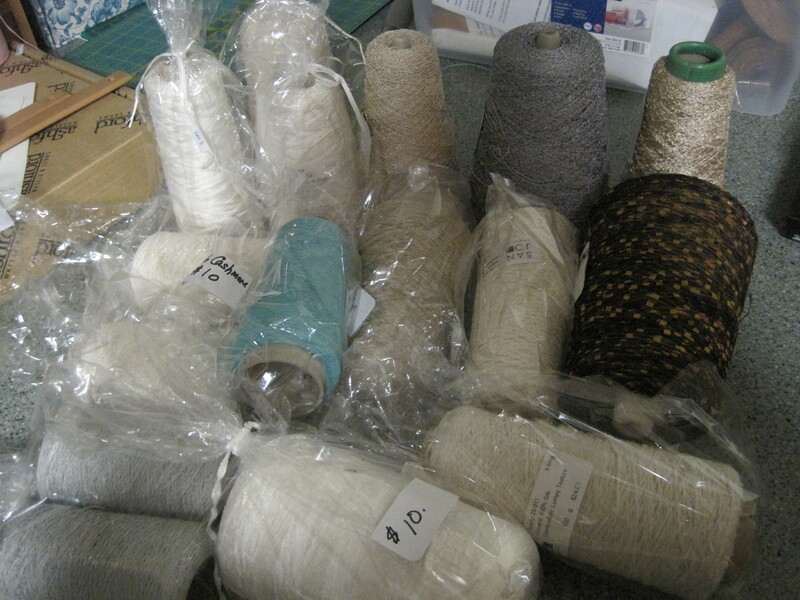 I foresee some fun weaving projects ahead. I have been absent from the blog, but I had a very busy year, mostly teaching and making samples for teaching, and being involved with guild activities. Here is my latest weaving that I wove just for fun. 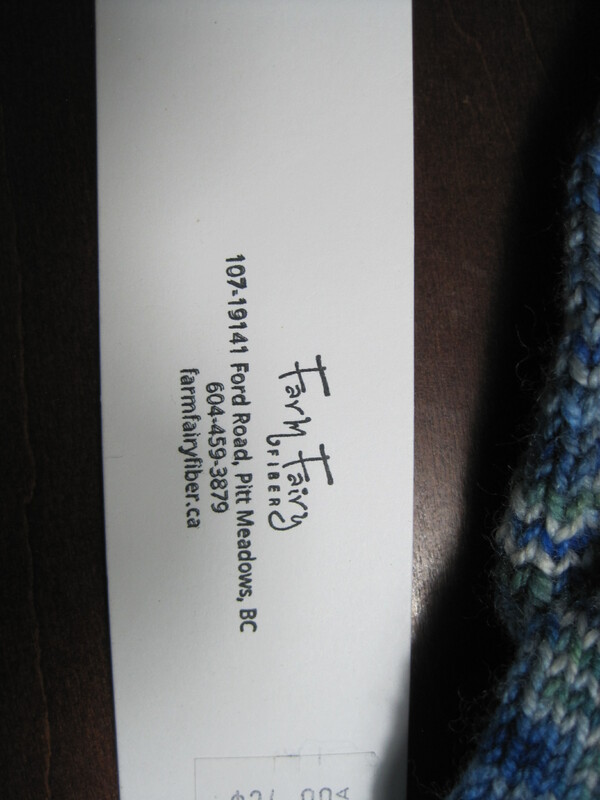 At the ANWG conference in Victoria this summer I purchased the Right Brain Gray Matter kit from Lunatic Fringe. The kit contained 50 gms each of 10/2 mercerized cotton in seven shades from black to white. I made a warp 4 yards long with this colour order. The warp is purposely asymmetrical. 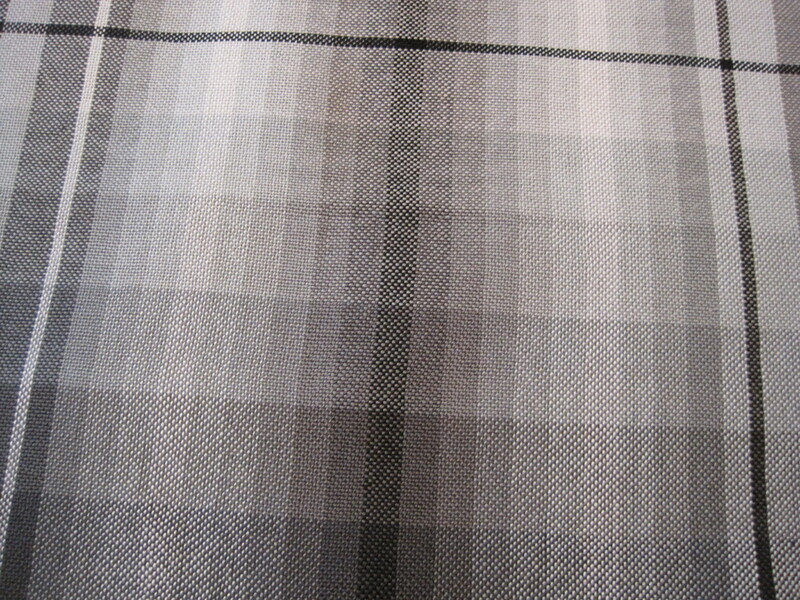 Weft: same as above plus 2/8 cotton in dark gray. Picks per inch: 20 p.p.i. 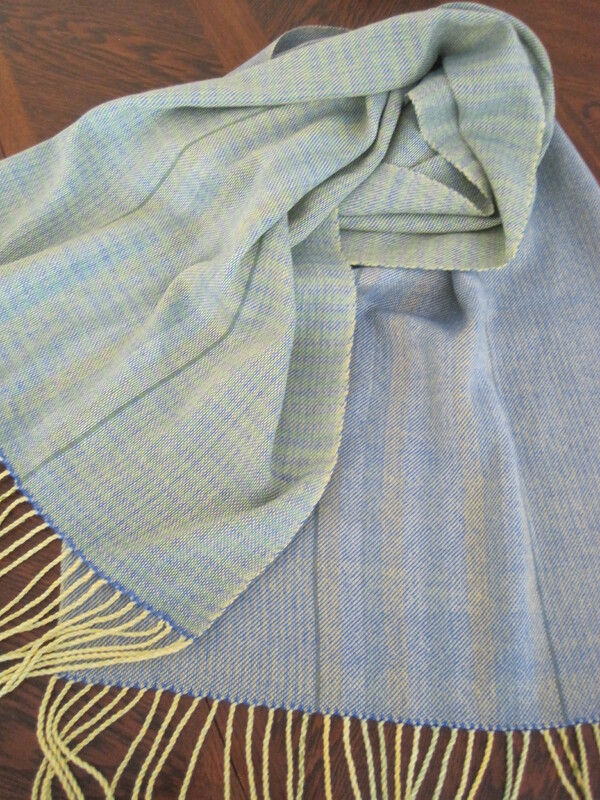 From the amount of threads available in the kit I was able to weave one napkin 19” by 19”. I love the optical effect and movement of the greys. And one tea towel 19” by 30”. When I squint at it, it makes me think of an x-ray, the way the light catches the shades of grey. By now, I had used up most of the 2/10 grey colours. 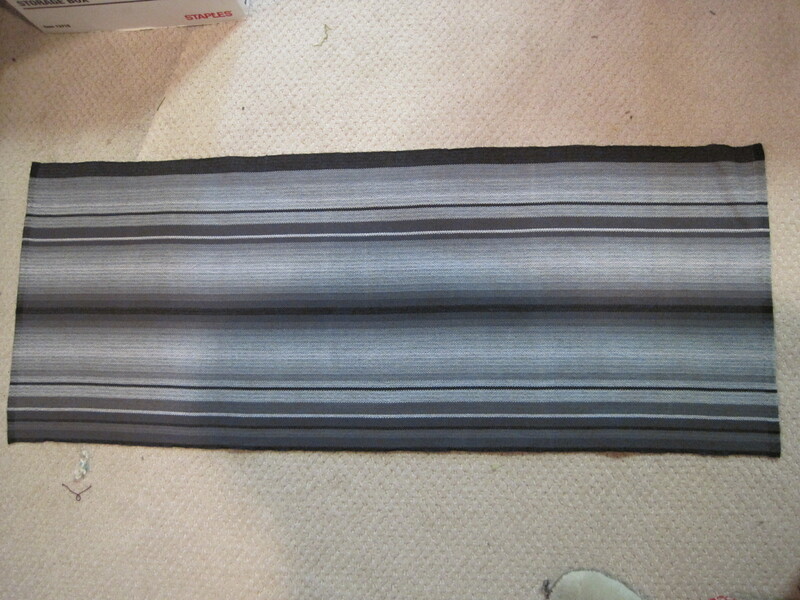 I cut the first two pieces off the loom and re-sleyed the warp to 30 ends per inch. 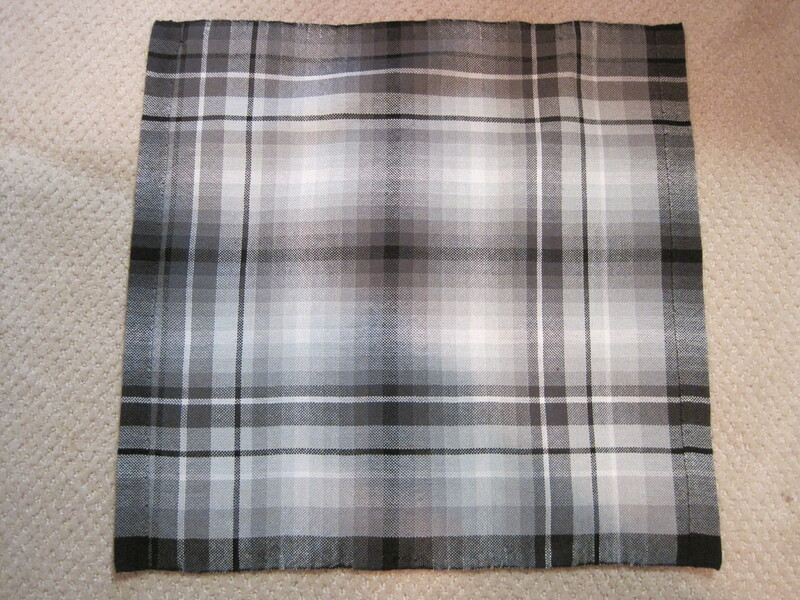 This I wove with 2.8 cotton in dark grey for a table runner 15” wide by 30” long. 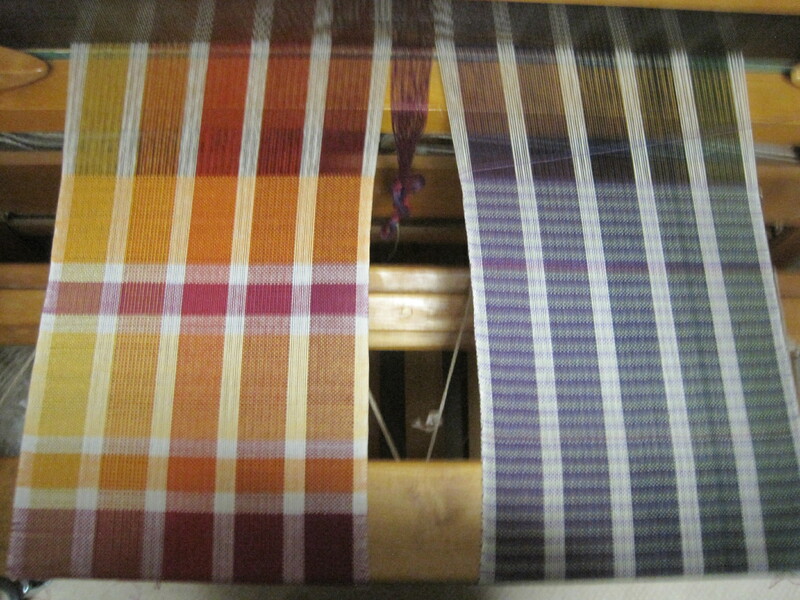 This warp dominant piece with the same weft throughout is much tamer than the other two pieces. All in all a great joy to weave.